Did that work? Seems you're still here. And they say blogging is hard. Pfft. I could do it with my eyes shut and one arm tied behind my back. Except um.. there might be a helluva lot of typos. Not to mention I'd be rather uncomfortable. Okay, scratch that idea then. 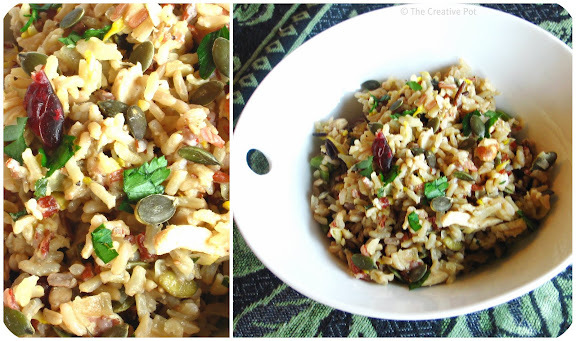 How about I show you a great recipe to use up leftover cooked rice instead? You in? Yup, I knew that I couldn't be the only habitual over-estimator when it comes to rice quantities. The problem is, those little grains are deceptive. They increase in volume during the cooking process. Devious little buggers. One day I'll learn how to make just enough rice. Promise. Until then though, I can take advantage of my inherent rice-making flaws with meals that make the best of the leftovers. And comes together in a matter of mere minutes. Perfect for weeknights. 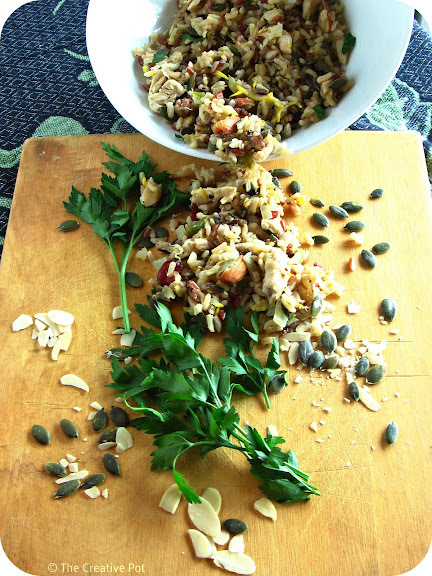 This nutty chicken pilaf is pretty straightforward to make and it reaps some handsome flavour rewards what with all that crunchy nut and seed action going on. You could use any combination of nuts in this dish, but I think the more exotic ones work best. The pattypan squash can easily be substituted by babymarrow (my original plan) or fried mushrooms to mix things up a little. 1. Heat olive oil in a large fryingpan and saute onion and greenpepper for 3 - 4 minutes until just starting to soften. 2. Add chicken strips and cook a further 5 minutes until just cooked through. 3. Add stock cube, nutmeg and 1/4 cup water, cook for a minute or two to dissolve the stock cube, then add rice and squash. 4. Cook another 3 - 4 minutes or until rice is heated through and squash cooked. Taste and adjust seasoning if needed. 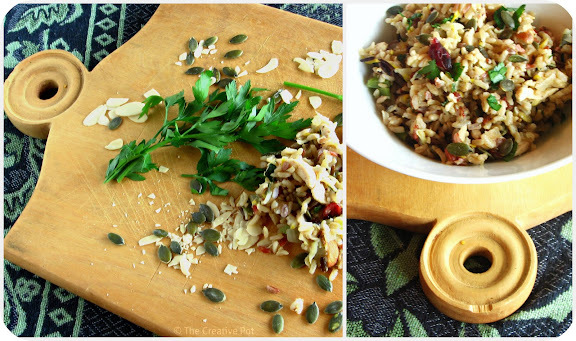 Finish off by adding lemon juice, then stir nuts and seeds through and sprinkle with chopped parsley. Love the foodstyling.......I can see how you are improving with every post, well done!! I love Culinary in the Desert! They are one of my favorite blogs. Rice can be quite devious. But you showed it. Oooh I like this. I love nuts and I love rice - put the two together, and you've got a winning combo. Lovely! Wendy - Good to hear it's not just me. I think this would be great with couscous or quinoa too. Nina - *blush* Thank you! Joanne - Agreed, very cool blog that! Diva - Yup, I love me some nuts..